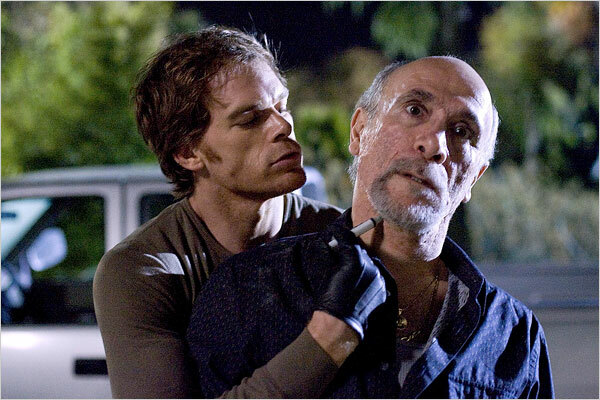 The second season of Dexter starts seemingly very aware of its main problem: how to get rid of The Ice Truck Killer. Memories of the man behind the name and his imposing presence in the first season linger conceptually for the viewer ('how can this season better the previous killer?') and literally for Dexter (Michael C. Hall), as he tries to move past the memories revealed during Season 1's finale. It's a pretty inauspicious opening in a season that takes much longer to get going than it should do, with lots more time wasted on the utterly pointless subplot between LaGuerta (Lauren Vélez) and her replacement Pascal (Judith Scott), showing once again that Dexter is a series which is at its best when it doesn't waste time on the politics of policing. The route Dexter: Season 2 takes in getting around the Ice Truck Killer problem is an interesting one and one that shows Dexter off as a series not afraid to take risks. In any other TV show, ol' ICT would have been replaced by another snappily monikered villain and things would move on in much the same vein as before. In a way, that kind of is what happens but the route the writers take to make it so means the whole thing, and Dexter himself, moves up a gear, as new cogs start grinding away at similar storylines. Its familiar but different, which is really the formula everyone strives for in the second season of a popular TV show. As the reveal of the 'new' killer focus for the series is pushed out, Dexter also pulls out its best episode to date, The Dark Defender (Episode 5), which makes literal the comic book connections of the show for anyone who hadn't spotted them already. Directed by Keith Gordon, the episode reads like a mini-launch for a superhero, Gordon showing a lot of comic book-nous in a perfectly judged piece of referencing that should delight anyone who's ever seen and liked a comic book film. It even has the Danny Elfman-style music, it's that well thought through. As the end approaches it becomes clearer that the character development of Lila (Jaime Murray) has been much better handled than her initial appearances may have suggested. Whilst her introduction may have been convoluted, her development in the final four episodes is anything but, a rare turn of events from a TV show that forces you to re-examine everything you thought you knew about the character. The final three episodes form a finale which takes on a pace Dexter has never before seen but manages to both sustain and to pull it off without pulling you out, all memories of the aimless opening few hours now banished. It is, again, a wonderful series from the team behind a killer idea, one that takes what it learnt during the first outing and actually builds on it, rather than rehashing or simply stumbling through old moves. Dexter: Season 2 is currently available on Netflix UK. Hall did (and continues to do) such fantastic work on this show. I hope the upcoming season does better than the last, but it's still a fairly good show. Glad you're catching up. Yeah, need to get hold of S3 (which a lot of people keep telling me is the best one), I'm ready to sit through another helping of it.